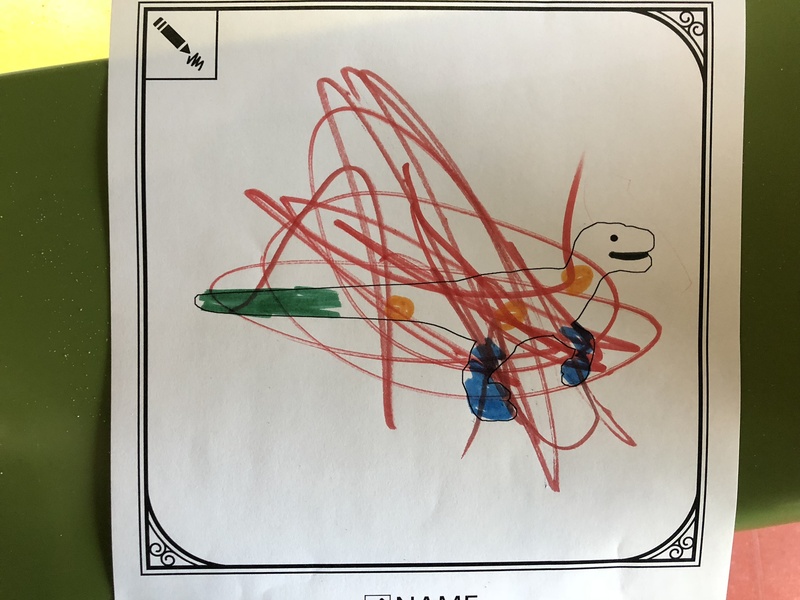 Dinosaurs and soft play – what more could a four year old want? 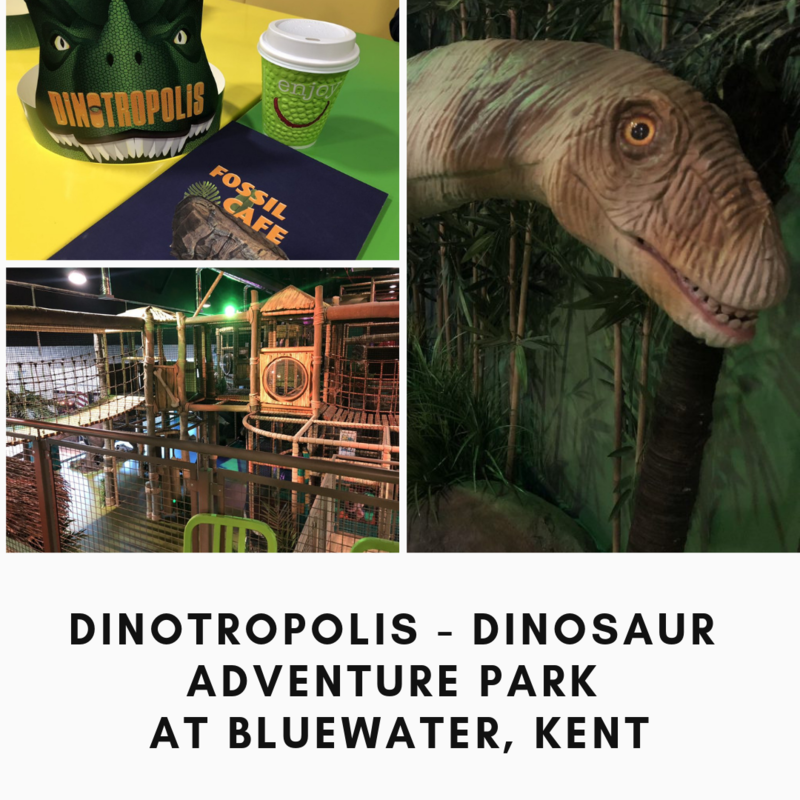 We were invited to check out a new dinosaur adventure park recently in Bluewater shopping centre in Kent and we were intrigued – it sounded different. Dinotropolis is situated right next to the Showcase Cinema on the Upper Plaza, above Gravity. Once inside we were greeted by two rather impressive animatronic dinosaurs. The boy headed straight off into the go-karts(Raptor Run) and had great fun zipping round and round. I wasn’t too keen on the space available to store shoes/coats/bags etc. 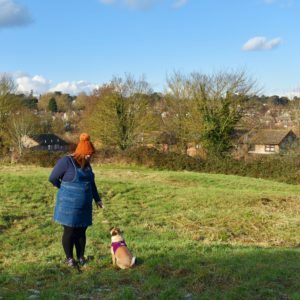 – I was on my own with the boy so needed to leave my handbag but there didn’t seem to be anywhere secure to leave it, the seating was on a main walkway and the shoe storage too small to store a bag. In the end I had no option but to leave our things under a coat, unfortunately wherever we went it was impossible to keep an eye on it. 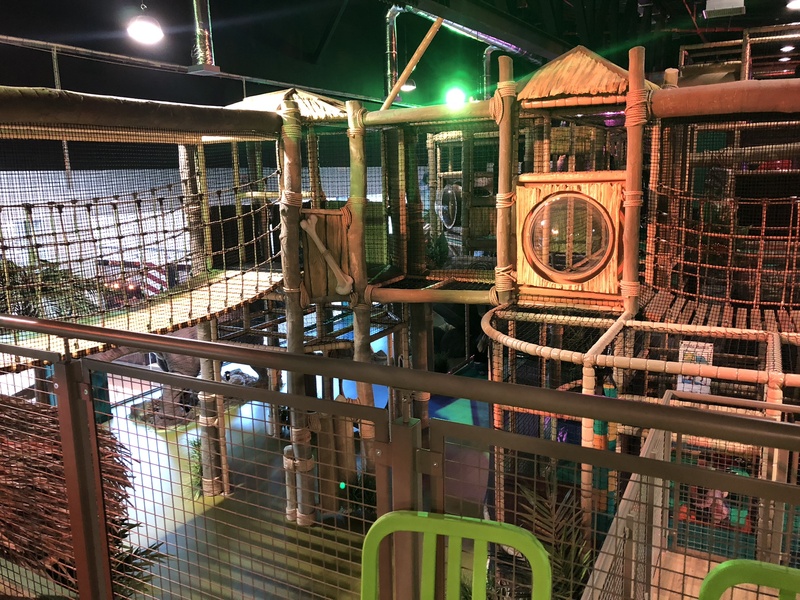 We explored the soft play(Dino Jungle) which was huge and great fun – there is so much to do and lots to keep little ones occupied with slides and lots of bits to explore. The top level joined back onto an upper walkway, meaning you can access the upper levels by stairs which in principal is a good idea however children were running from top to bottom up and down the metal stairs and I didn’t find it particularly safe, personally I prefer an enclosed soft play area that is, well, soft. 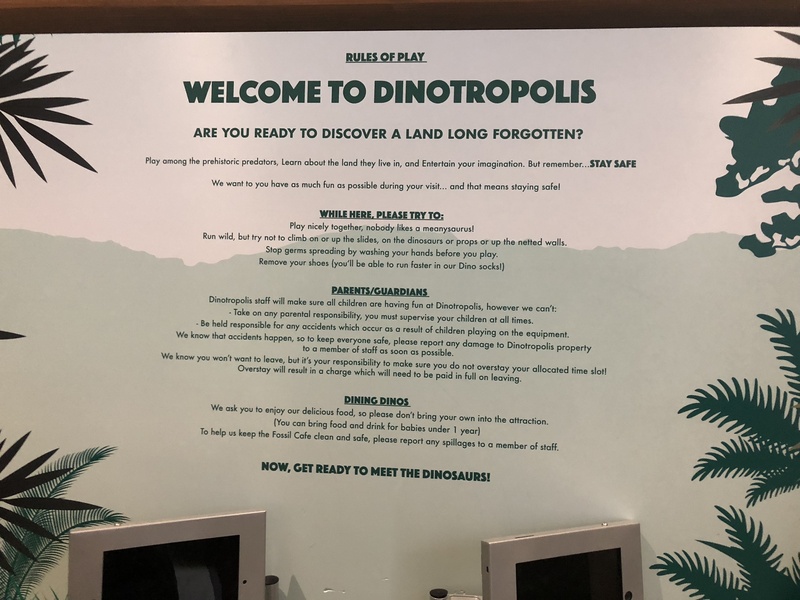 We checked out the escape room(Dino Escape Challenge) where you have to avoid the lasers to not wake the dinosaurs. The boy wasn’t keen – he said it was too dark and a little bit scary. 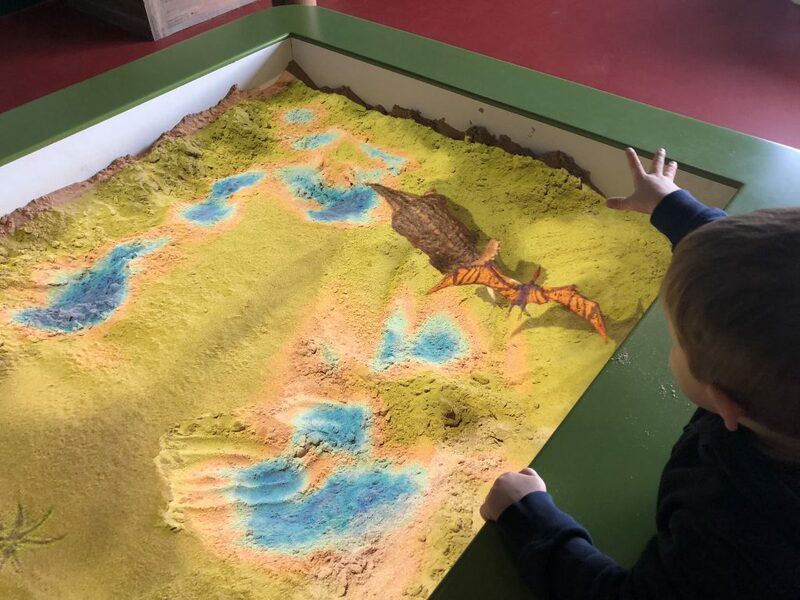 The last area is Discovery Cove which we really enjoyed – there is an interactive sand pit where you can dig holes that turn into blue pools or make mountains that turn into volcanoes complete with lava. My only issue is that it’s a little high up for small people and I had to lift the boy up to use it. The sand was also a little too dry to build anything. There are two 3D puzzle dinosaurs to build plus a number of tables with colouring sheets and pens/pencils. 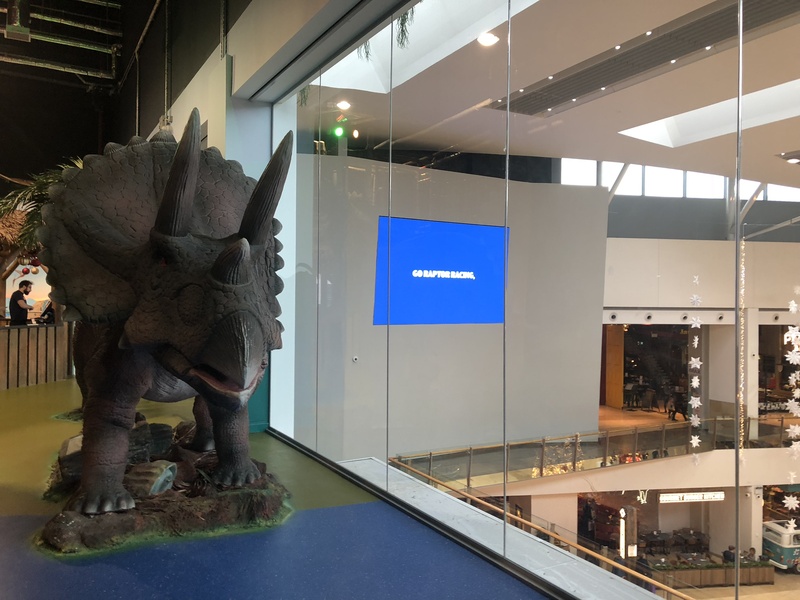 You colour in a dinosaur picture and a member of staff scans it and it appears on a big screen, which is pretty cool. Again the boy was too small to reach the pens in the middle of the tables so he needed a little help from me. 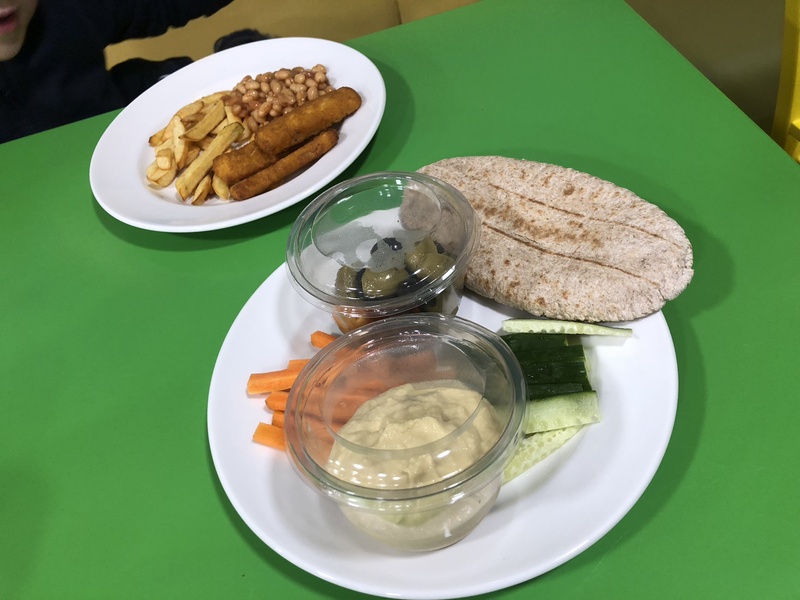 We headed to the Fossil Cafe for lunch which unfortunately wasn’t great; the menu has something for everyone and I was impressed with the healthier options available however the food was of poor quality for the price. I wanted to opt for a lunch box style deal but was told this could only be pre-bought or I’d had to go back to reception to buy it – or I could buy the sandwich, crisps and drink separately. I think it’s a great idea to offer a meal deal when booking but it seems crazy to not include it on the menu. 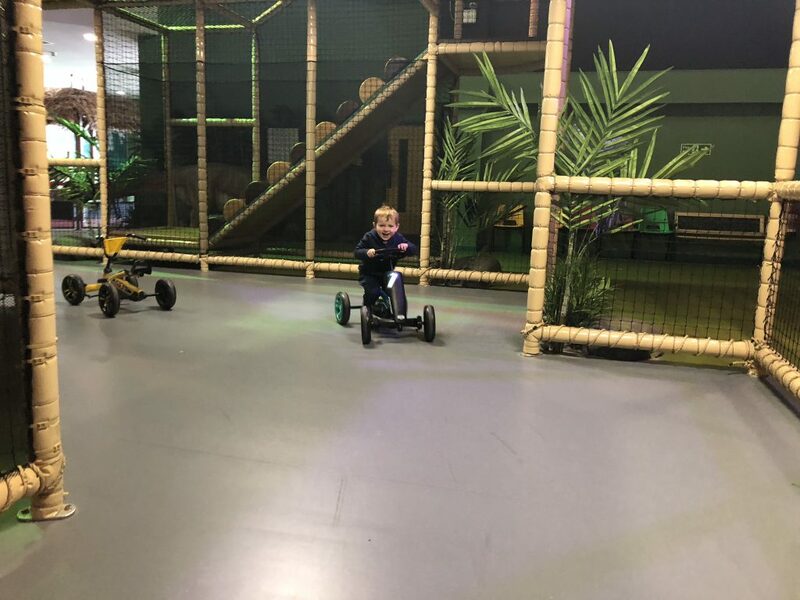 We headed back to the go-karts for a quick zip around before heading home – sessions are 90 minutes long which passes very quickly and is a little too short. Okay, so overall it’s an awesome idea and it has the potential to be amazing however there are some issues. Price wise it’s very, VERY expensive for what is effectively soft play. Children aged 0-18 months are free and all other children up to 18 years are the same price depending on which package you opt for. 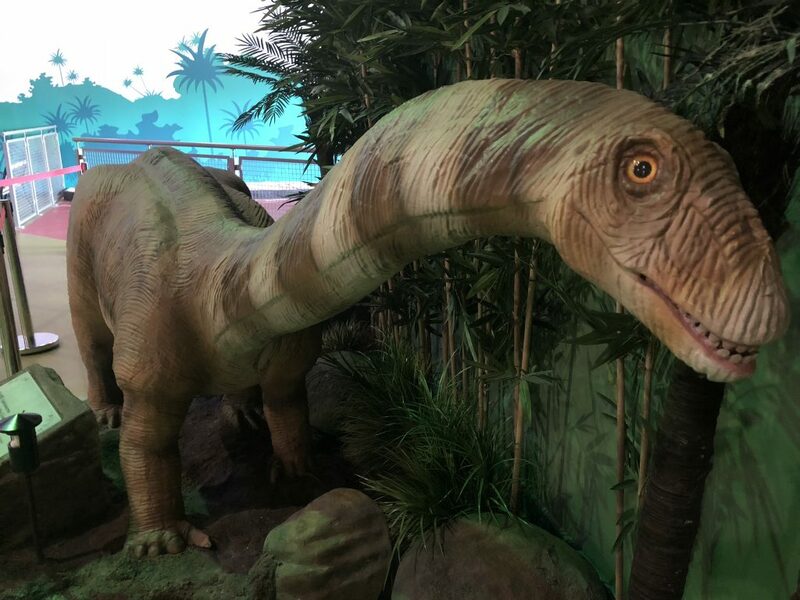 There are three options – the Explorer pass is £12 which gives access to everything except the Dino Escape Challenge. 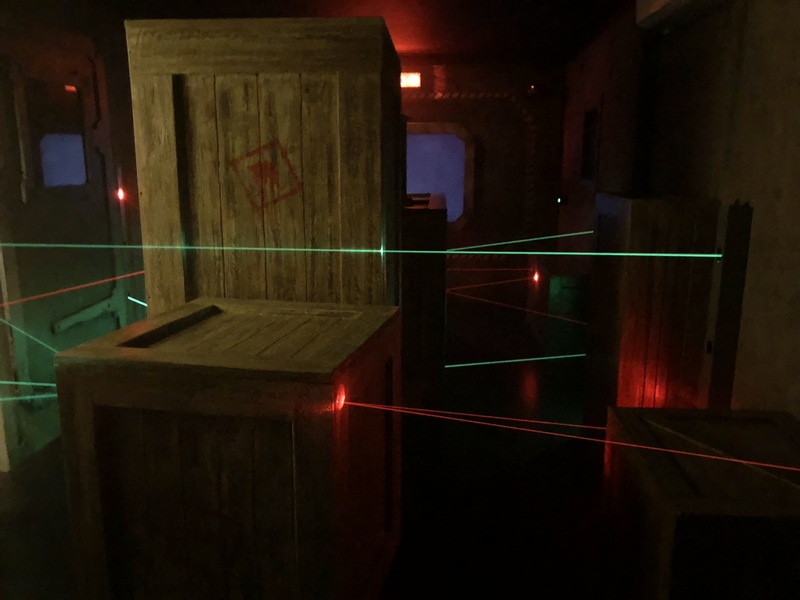 The Discovery pass is £15 which gives access to everything including the Dino Escape Challenge – so the little laser room crazily costs an extra £3. The last option is the Ranger pass which gives access to everything including the Dino Escape Challenge and includes a meal deal(sandwich/baguette, crisps/chocolate plus bottle of drink). Adults are £5 each – meaning if I wanted to take the boy and do everything it would cost a whopping £25. Sessions are also restricted to 90 minutes? So, yes, potentially £25 for 90 minutes of play and kids lunch, and that’s just for one child and one adult. Ouch. 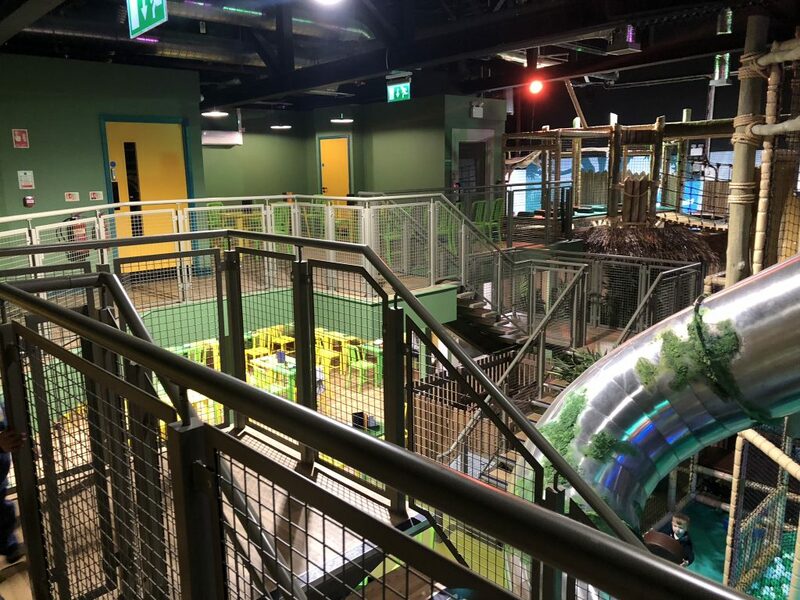 The soft play is awesome but the overall price is extortionate for what it is – I found that it wasn’t easy to keep track of where the boy was, there was no secure place to store belongings plus as mentioned above the upper levels access onto the soft play/metal stairs is a safety concern. The food was awful – the menu looks great and offers some good options but it’s terrible quality considering the price. Adults get a ticket for a free drink on entry but no one mentioned that this is restricted to hot drinks and water until I’d picked up a soft drink. The scenery and dinosaurs are impressive but we saw children climbing on them, I noticed that one is cordoned off and has damage already which is a shame. It’s also a lot to cram into the 90 minutes you get – two hours would be better, we felt quite rushed, especially when eating too and we ran out of time. 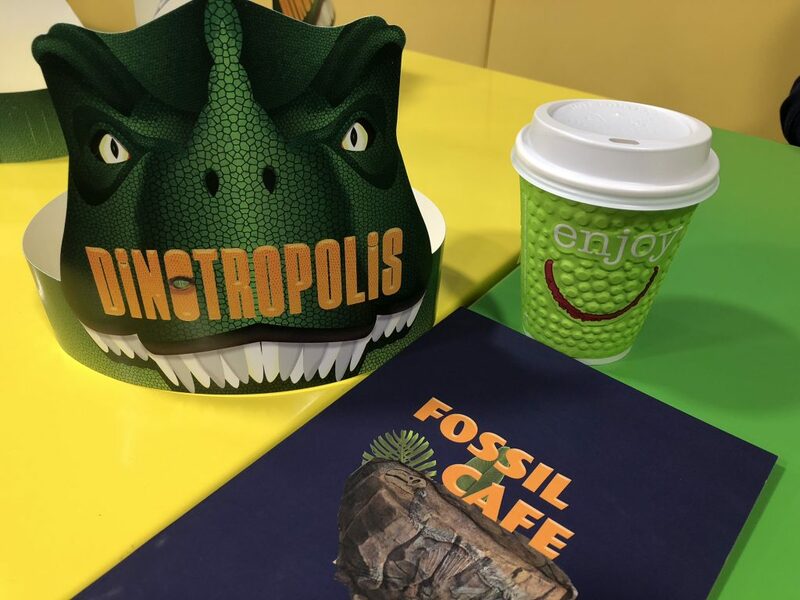 Dinotropolis is an awesome idea and the soft play in particular is great but the price is just too high for what it is – if the price was lower then we’d consider returning but I probably wouldn’t eat in the cafe again. The time restriction is also off putting – 90 minutes just isn’t long enough to fully enjoy everything. You can find out more and book on the website here.